Looks like fall in a glass! I find exactly what I’ve been looking for. Like a gigantic crate of quince. Or a giant pile of adorable parsnips. Or both. I had been looking for quince for WEEKS and finally got there on the right day. I can honestly say I’ve had my fill of them…for another week or so, at least. All kinds of fruits and stuff just peekin' out there. When I also ran into the aforementioned parsnips, I knew what I had to do. I had to get some pears! The step after that was a little hazy, but I knew I had once scribbled a note along the lines of “quince custard, pear and parsnip compote” and it had been nagging me quietly since it started getting chilly out. 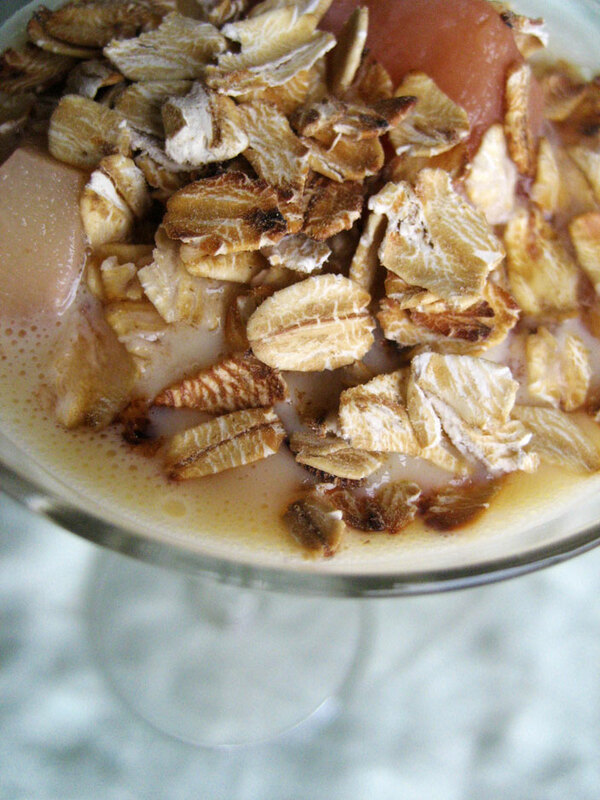 The layer of oats reminds me of dried leaves on the ground. Of course, such a smooth, squishy dish needed a bit of crunch and toastiness, so I turned to my friend, good old Mister Oat. I love Mister Oat! He’s healthy, gets included in my breakfast almost every day lately, and makes a damn fine cookie. I like what I came up with here because even though it involves several steps, they’re very simple and actually require very few ingredients. 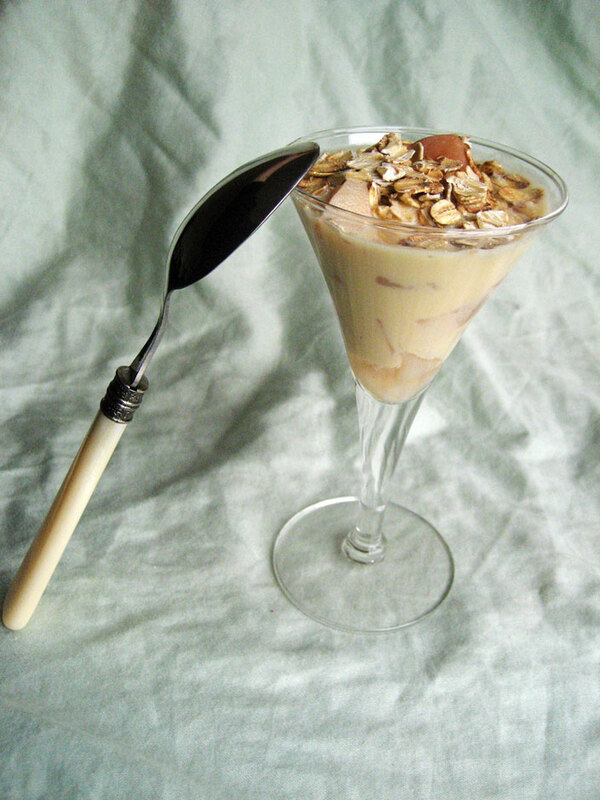 The resulting warm parfait-thing is surprisingly (relatively) healthy and very much an elegant autumn-type dessert. 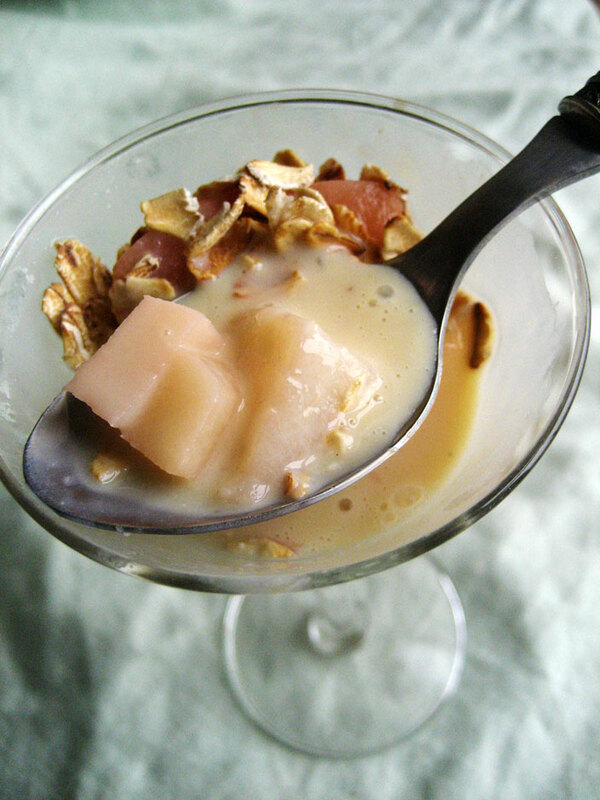 The quince adds a lovely color to the other-wise, well, oatmeal-colored dessert. While the components (quince aside, because YUM) don’t taste like much on their own, together they really do make a harmonious glassful of comfort. Unusual but so very very good. Peel and core the quince,then cut into slices. Place in a large pot with the other ingredients and simmer for 2-3 hours, until the quince has turned pink-orange and is soft but not falling apart. Set aside to cool. Place the oats in a small, dry frying pan over medium-high heat for about five minutes, stirring constantly. Once fragrant and visibly toasted, remove from pan and let cool. Now It’s Time to Poach Some Other Stuff! Dice the pear and parsnip into equal sized cubes (you basically want a brunoise). Place in a saucepan and add just enough of the quince liquid to cover, then simmer until the parsnips are cooked through. Set aside. Better Get Ready for the Custard! Place the liquid in a small saucepan and bring just to a boil. Gradually pour the hot liquid into the yolks, whisking constantly, then return the mixture to the pan and cook over low heat, stirring constantly, until it thickens enough to coat the back of a spoon. Strain and set aside. 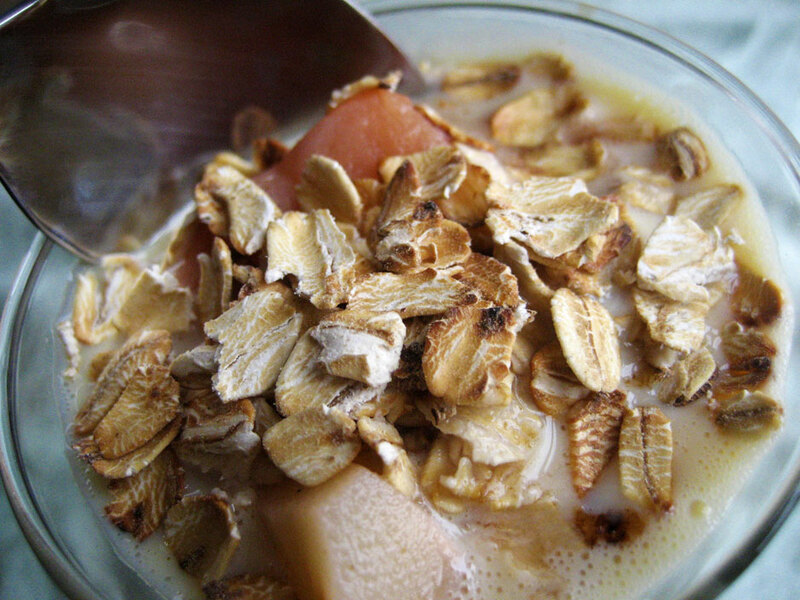 Start with all your ingredients (except the oats) slightly warmed. 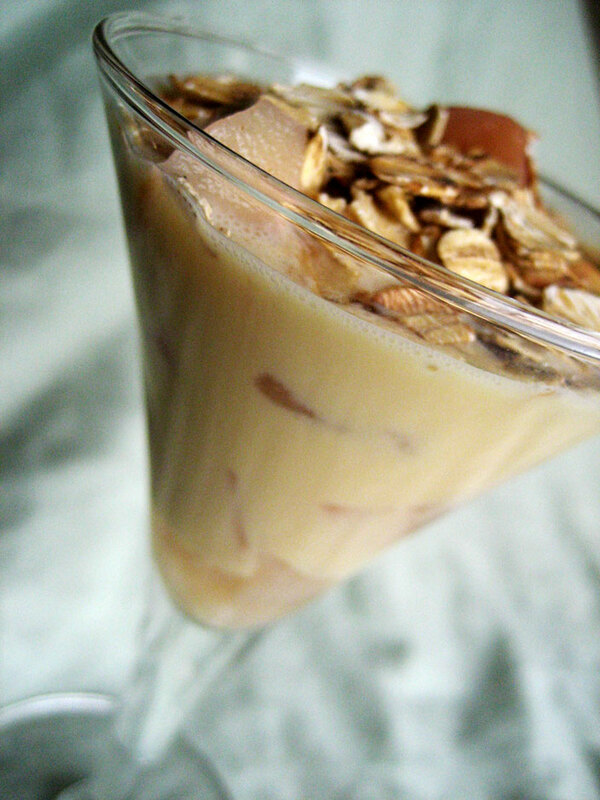 Layer a spoonful of the pear/parsnip compote in the bottom of a glass, then add a spoonful or two of the custard. Add a couple of wedges of quince, then more custard, then a little more compote. 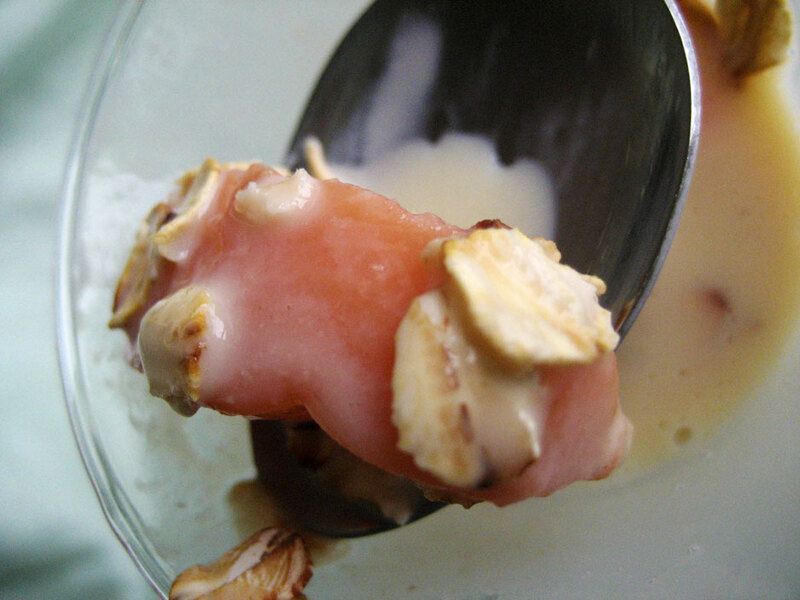 Top with custard, another slice or two of quince and a generous sprinkling of toasted oats. Serve immediately. You could seriously just eat this for breakfast if you wanted – it’s pretty low in added sugar and the only fat comes from the egg yolks. I love that two of the components reuse part of another component – that’s another reason why it seems like such a simple dessert despite its layered, multi-component nature. I love that market too!! 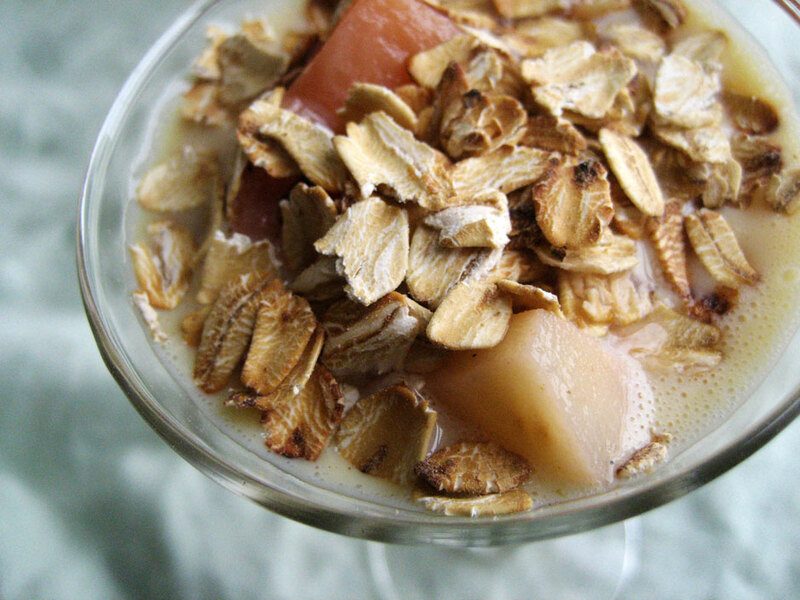 Quince custard, pear and parsnip compote with toasted oats …. these are a few of my favourite things… as the song goes I LOVE LOVE LOVE the flavour combination you have created this really is a delightful dish and it looks so delicious well done will give it a go when it is quince season here in Australia, Cheers from Audax in Australia. Oh my, I LOVE this post…what an adorable blog you have too!!! Nice to see you are co-hosting the next DB challenge…looking forward to it!